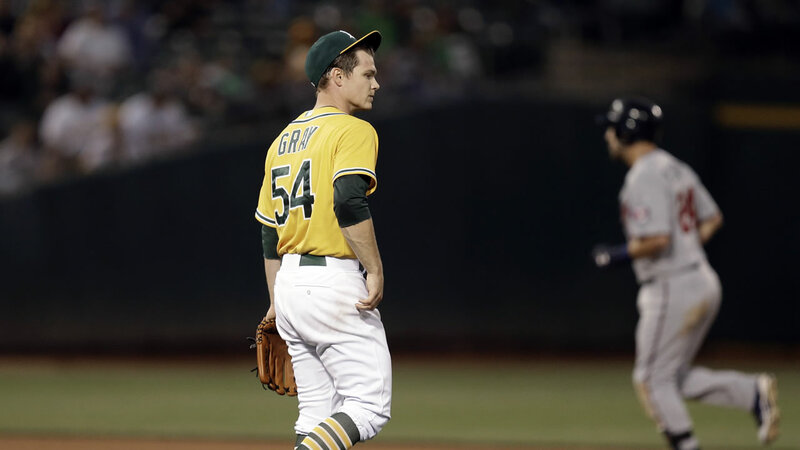 OAKLAND, Calif. -- Sonny Gray rarely gives up home runs, and this time he surrendered two, one a grand slam. Oakland's All-Star ace rarely needs long innings to get through opposing batting orders. On Friday night he threw 38 pitches just to finish the sixth. Trevor Plouffe hit a grand slam against Gray in the sixth inning after Brian Dozier led off the game with his 20th home run, and the Minnesota Twins beat the Athletics 5-0 on Friday night. "It is a surprise when he gives up a home run. It really came down to two pitches where they scored all their runs," A's manager Bob Melvin said. "He threw a lot of pitches in the sixth, something he normally doesn't do." After Aaron Hicks drew a one-out walk in the second, Gray (10-4) retired 11 straight before Dozier walked to get things going in the sixth. Gray - who won his only two previous starts against the Twins, both in 2013 - allowed five runs and five hits in six innings with four strikeouts and two walks. He was done after that 38-pitch sixth. "I made a few bad pitches and they took advantage," Gray said. "I hung an 0-2 pitch to Plouffe, he put a good swing on it and got just enough of it. Maybe my stuff just wasn't as sharp." Plouffe figured he had a sacrifice fly, calling his second career grand slam "a little wind-aided." Ervin Santana received the game ball from Joe Mauer after his first win with Minnesota, and he waited months to finally earn it. Santana worked out of a bases-loaded jam in the third and won in his third start since returning from an 80-game suspension for performance-enhancing drugs. The veteran right-hander allowed five hits to improve to 15-6 with a 2.03 ERA in 27 starts against the A's. "I don't know (why) but I like it," he said, grinning. "Good numbers." Minnesota (50-40) holds the second-best record in the AL behind division-leading Kansas City. Gray surrendered just his sixth and seventh homers of 2015. Dozier also hit No. 20 at Oakland last season. "The sixth was just weird. There's no way to explain it," Oakland catcher Stephen Vogt said. "They laid off some good pitches that Sonny usually gets swings on. It's more a credit to their hitters. Five days ago he was at his sharpest. It's not easy to come off a break and feel great." Plouffe also singled for Minnesota, which had lost nine of 10 at the Oakland Coliseum and hasn't won a series here since a two-game set May 18-19, 2011. The Twins have lost four straight series in Oakland.